There is now a new range of integral blinds for front doors available from Morley Glass & Glazing. The new Screenline SL16 integral blind system improves front doors, such as composite doors. It even enhances vertically sliding sash windows. Slimline integral blinds for front doors and sliding sash windows. Rocal Endurance solid core front doors. Truedor composite front doors and many other brands. We recommend you check to ensure that the integral blind will work with these and other brands of composite doors. Current generation aluminium and PVCu windows and doors use 24mm or 28mm glazing cavities. These work for both for energy efficiency and to simplify window design. Another reason is that consistent glazing cavities give systems companies and manufacturers simplicity in manufacture. A good example is access to the industry-wide range of glazing gaskets and wedges, glazing tapes and packers. These and other components manufacturers use to glaze a window. 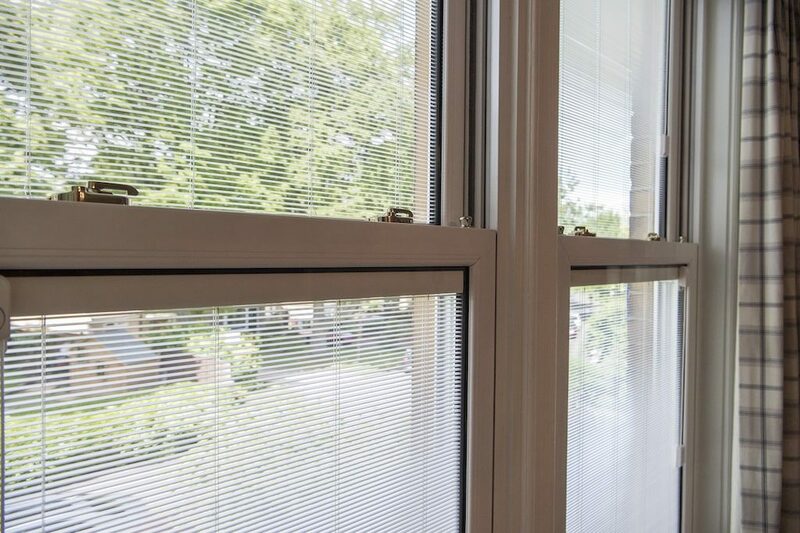 Integral blinds have historically only been suitable for a 28mm glazing cavity. Widely used for bifolding doors, sliding doors, windows and hinged doors, now they suit front doors and sliding windows. Certain products like composite doors and vertically sliding windows often have thinner glazing cavities. Therefore a slimmer integral blind is required. This is where the Screenline SL16 integral blinds for front doors and sliding windows provide a great solution. The benefits of the Screenline SL16 slimline integral blind system. The SL16 integral blind is the first integral blind that can be used within a narrower, 16mm glazing cavity. There are also other benefits. 10mm slimline slats provide all the benefits of an integral blind with a reduced sight line. Ideal for use in many brands of composite doors. Can be used in vertical sliding windows. Blinds are available in white, beige or silver colours. For vertically sliding windows, the integral blind should suit the many PVCu brands such as Rehau, Masterframe, Spectus, Roseview, KAT UK and others. Again we recommend you check for suitability with these providers first. Like all Morley Glass integral blinds, as standard comes quality glass, first-class manufacturing and warm-edge spacer bars. These new integral blinds for front doors come in the choice of the SL16 Venetian blind with a slider control or the SL26C Venetian blind with cord control. Screenline Integral blinds for the complete home. The one advantage of the new SL16 Screenline integral blinds for front doors and sliding windows a complete home solution. You now have access to integral blinds in all the window and doors in a house. Here is an explanation of many features and benefits of blinds housed between two panes of glass. Therefore. taking a very typical house today with a traditional front elevation and a modern extension at the back as an example. The facility exists to have integral blinds throughout. Contact us if you would like further information about integral blinds for front doors, bifolding doors and windows. I am looking to fit integral blinds into 3 pairs of internal 44 mm thick doors ideally the blinds will be dark grey or black. Please confirm the cost of each glazed panel with integral blind for half glazed doors and heights and widths available. Please send details of how the blinds are operated. Hello Mark, thank you for your question. Our website is an information resource only and does not quote directly or provide any products. Morley Glass that makes these blinds should be able to put you in touch with a local dealer. Can you repair integral blinds? Some questions answered.